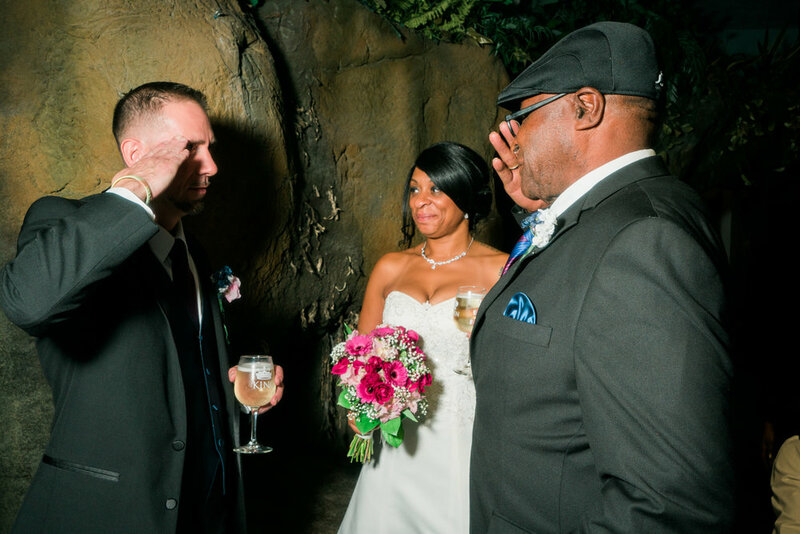 Recently, I had the pleasure of photographing Sharee and Jason Cox's wedding at the Point Defiance Aquarium. This wedding, however, was unlike any other I'd shot before. For one thing, it was at an aquarium with difficult lighting, but that was the least of my worries. What made this one different was the fact that the make up artist cancelled on her mere hours prior to the ceremony. She had overbooked her day and still needed to get to a couple more clients in a city still an hour's drive away. To say the least: there was no way that the ceremony could have even a chance at starting on schedule. While brides often face a bit of stress the day of, this was quite a tough one. Most of the bridal party traveled far and didn't have any sort of makeup on them, and time was running out. Thinking fast, we got her over to the nearby Nordstrom make up counter where some of the amazing ladies there worked quickly to save the day. With a huge thank you to them, the wedding was able to start on schedule. If you're in the Seattle area and would like a Wedding Photographer, please get in touch!